By Admin in Resources on June 18, 2018 . Homeschooling and unschooling moms, dads, and kids will love tees with this humorous twist on the “S” question. Quirky humor tee makes a great gift for the weird unsocialized homeschoolers and unschoolers in your life! 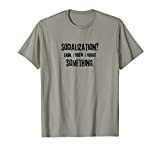 Funny t-shirt for homeschooled and unschooled families: Socialization? Darn, I KNEW I forgot something! Click on Homeschool Snark above to SEE THIS DESIGN on dark shirts too!